The Merit 715E elliptical trainer has a small footprint, a 16" stride length, and an EZ-For-One Assembly design. This basic model from Merit Fitness is one of the better choices in low cost ellipticals. The two LCD windows show time, distance, speed, and calories burned. 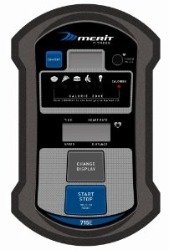 The console is powered by two AA batteries. 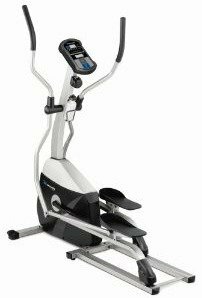 The Merit 715E elliptical has a listed 275-lb user weight limit which should be ignored. These machines are for seniors or lightweight people of no more than 170 pounds. The 16" stride length is also better suited for a smaller person, although the nearly 7" wide pedal stance may be awkward or uncomfortable to some. (As a comparison, top end ellipticals have about 2" of space between pedals. This elliptical trainer also comes with a 10-pound flywheel, eight levels of manual magnetic resistance, and a 5-groove Poly-V drive belt. At 103 pounds, it is around 25 lbs heftier that other trainers that sell for under $400 so that’s another positive for the Merit 715E. The heavier the elliptical is, the more stable it will feel to ride. The thumb pulse heart rate monitors are not accurate so be sure to buy a handheld HR monitor if you want to check your pulse during exercise. Some people spend $400 and expect it to perform like a machine costing twice as much, while others simply realize that budget ellipticals cannot be ridden hard. The Merit 715E elliptical is about as sturdy a unit as you’ll find for under $350. It has only a single rail roller system, so it won’t be as durable as a pricy model, but it should last a couple of years with moderate use and if you keep the rails as clean as possible to improve performance. For $329, the Merit 715E is an okay elliptical, but you might want to compare it to a Schwinn A40 that sells for the same price.